to be used in the $6 million Oro Loma study. 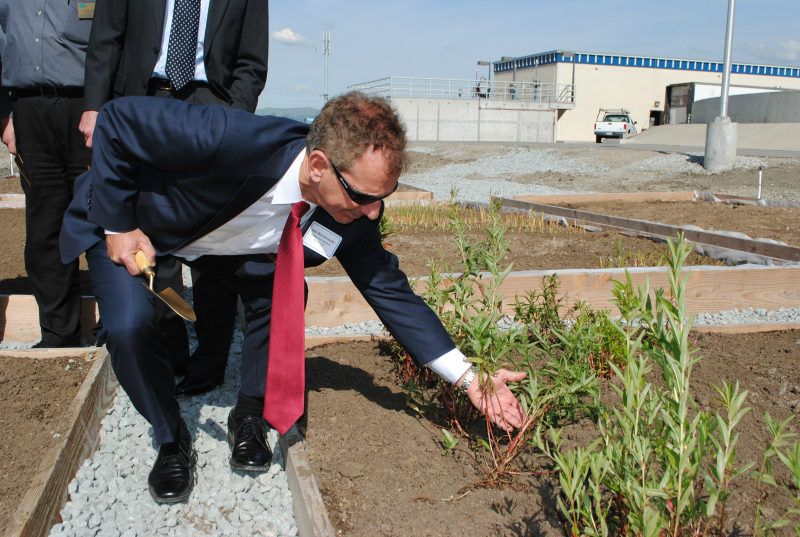 >>>Global warming and sea-level rise is also a continuing concern and the Oro Loma Sanitary District unveils a plan for the San Francisco Bay with a study to use native vegetation to rebuild the shoreline. >>>Oakland’s affordable housing advocates fiercely oppose the sale of publicly-owned land to a developer for a proposed exclusively market-rate 24-story luxury complex near Lake Merritt, known as the 12th Street remainder parcel. The $5.1 million price tag is also questioned as too low. >>>In an almost unprecedented move, the California Democratic Party not only endorses Susan Bonilla over Steve Glazer–both are Democrats–but vows to open their wallets to support her campaign. >>>An independent investigation finds Oakland City Attorney Barbara Parker “haphazardly” prepared arbitration cases against disciplined Oakland police officers. >>>With a new Oakland city Department on Race and Equity up for consideration during the June budget process, Mayor Libby Schaaf proposes her own new bureaucracy, a Department of Transportation. The $2.4 billion two-year budget unveiled by Schaaf also asks to hire 40 new cops next year. 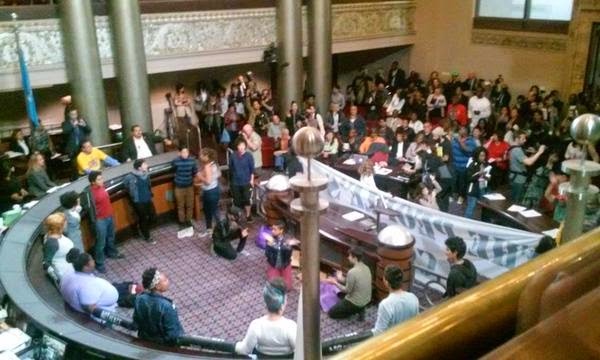 >>>Activists force the early adjournment of a Oakland City Council meeting after protesters shutdown the proceeding which was to include deliberations over the 12th Street remainder parcel sale. The protest leads the council to briefly, and possibly illegally, curb public access to council meetings. >>>The number of people wearing diapers in the Lockyer household will increase. Bill Lockyer, 74, says former Alameda County Superivsor Nadia Lockyer is pregnant with twins. >>>Oakland Mayor Libby Schaaf enforces existing laws confining nighttime protests to sidewalks. At least that’s her argument, but the edict is likely unconstitutional and is its enforcement is relaxed. >>>Alameda County Supervisor Nate Miley tells a Southern California radio station, “I hope that we can keep the Raiders, but I’m not real confident.” He also reiterates his idea to remodel the existing Coliseum. Rep. Mike Honda in CA17. 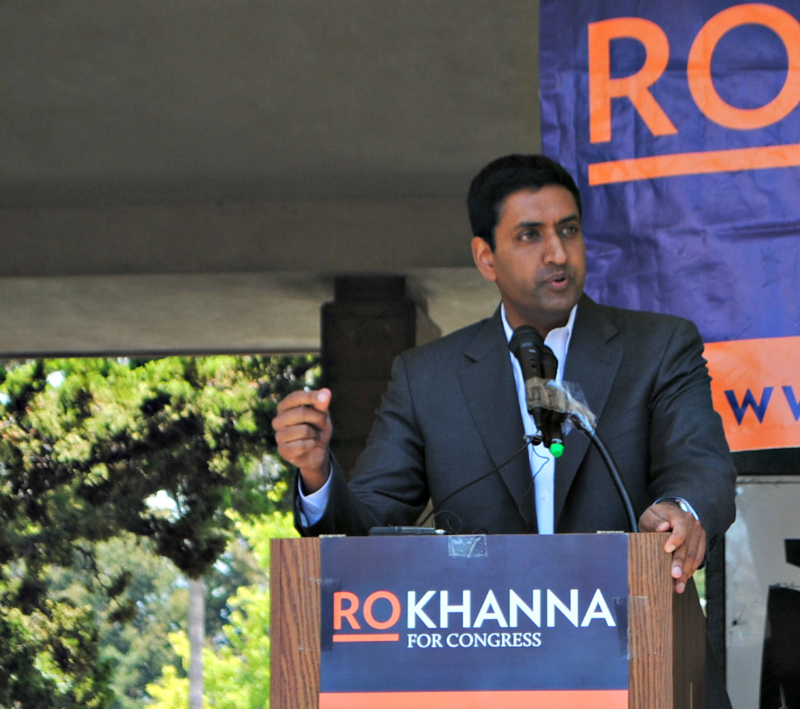 >>>In April, Ro Khanna reports impressive fundraising totals, more than suggesting he will challenge Rep. Mike Honda. A month later, Khanna officially announces his candidacy at a rally in Santa Clara. >>>A poll just days before the Seventh State Senate District special election shows Steve Glazer leading Susan Bonilla by 10 points. The survey is very accurate. Glazer beats Bonilla on Election Day by nearly the same spread. >>>Termed-out in 2016, State Sen. Loni Hancock announces her endorsement of Sandre Swanson to replace her in the Ninth State Senate District. The endorsement is three years in the making after she promised to back him in if did not challenge her re-election in 2012. Assemblymember Rob Bonta will endorse Swanson a week later. >>>The Golden State Warriors become NBA champions. Oakland Mayor Libby Schaaf leads the victory parade with M.C. Hammer in tow. Later, Alameda County Supervisor Scott Haggerty’s speech goes too long and he’s jeered by fans more interested in Riley Curry. 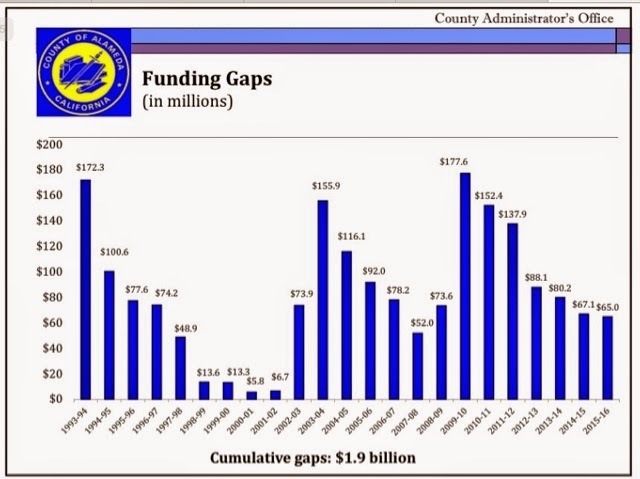 >>>The local economy seems to revving once again, but Alameda County’s budget deficit remains the same as the previous fiscal year. At $65 million, the budget deficit, however, is still far more manageable than the excruciating cuts made during the Great Recession. >>>A court decision that could have resulted in the dissolution of the publicly-elected Eden Township Healthcare District finds it will not have to pay in a lump-sum $19.7 million to settle its case with Sutter Health over legal fees in the fight to keep San Leandro Hospital open. Instead, the judge orders them to pay the fees spread over 10 years. >>>Alameda Mayor Trish Spencer uncorks a real headscratcher when she tells a sister city delegation from the Philippines that many similarities exist between her family’s culture and that of Filipinos, such as, lots of hugging and eating of white rice. >>>Oakland Councilmember Desley Brooks’ Department of Race and Equity is born after the City Council allocates funding for it in the next fiscal year budget. >>>An Alameda County Grand Jury report comes down strongly against the City of Fremont for an email retention policy that subverts state transparency laws. Government emails were allowed to be automatically deleted after just 30 days. Later in the year, the city will propose a new policy. 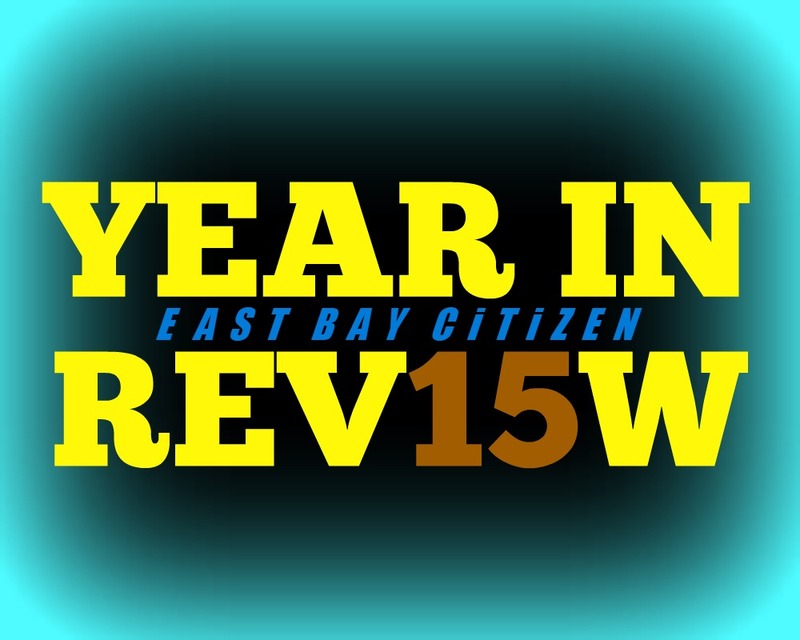 Posted in 2015 Year In Review, Bill Lockyer, drought, Eden Township, Oakland City Council, Ro Khanna, SD7 special election, Steve Glazer, Susan Bonilla, Trish Spencer, white rice. Bookmark the permalink.